Talk about big shoes to fill: Not since Mads Mikkelsen embodied Hannibal Lecter, the serial killer made famous by Anthony Hopkins, has there been such an iconic horror villain making the transition from film to television as Norman Bates. When he first signed up to play the split-personality motel owner from Alfred Hitchcock’s Psycho, Freddie Highmore was mostly known as the little kid from Tim Burton’s Charlie And The Chocolate Factory, a child actor who was suddenly faced with the burden of portraying the young-man version of one of cinema’s best-known characters. (And as Hannibal Lecter had demonstrated, the prequel route didn’t seem like it would go well.) 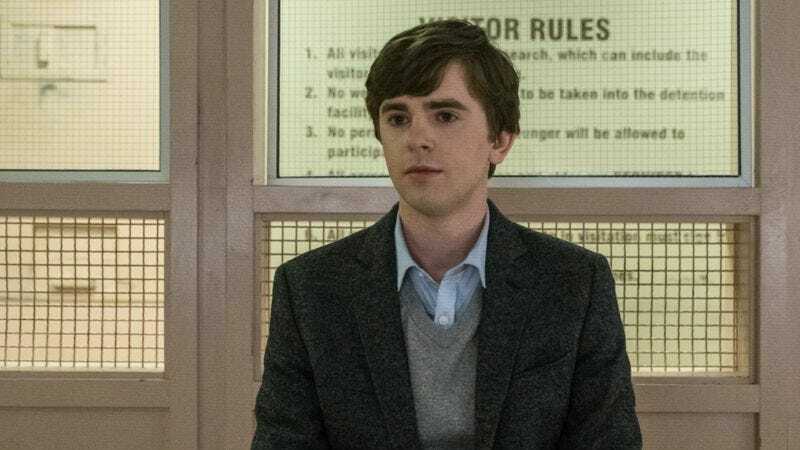 But over the course of five seasons on Bates Motel, Highmore turned Norman Bates into so much more. His deft and increasingly masterful portrayal of the youngest son of Norma Bates became a new benchmark for the character’s depiction in culture, and was even rewarded with a People’s Choice award for Favorite Cable Actor this year for his efforts, as was Vera Farmiga for her role as Norman’s mother, Norma Bates. When he spoke to The A.V. Club, Highmore was animated and reflective about his time on the series, and just as curious to hear others’ thoughts on the finale as he was to talk about his own feelings about the subject. The A.V. Club: No, it was a very satisfying ending, narratively. Did you feel like that? FH: I felt like it was satisfying. I think it was a really beautiful end, and a fitting end. The only real end that there could have been to the story. I think if we look at Norma and Norman, the two of them as the central love story to Bates Motel, that the two of them have to be together and reunited, and that’s what happened. It was lovely as well the way that every single character really got their moment. Obviously, Norma’s came a season earlier than everyone else’s, but “Mother” had her own departure, and obviously Romero has his big moment, and then the end is about Norman and Dylan and the two of them getting their final say in things. But yeah, I think it was a fitting conclusion. It was sad, hopefully, and heartbreaking, but in a good way. It’s just funny it’s all over, really. I can’t quite believe it. AVC: When you think back to the very beginning, has your idea of how you understand the story and series changed from when you first signed on five years ago to now? FH: I guess you wouldn’t dare to dream that you would get to the end of five years and be able to finish it up on the writers’ terms. In many ways, it was the perfect experience. I think because I was lucky to be a part of the writers’ room and writing episodes in seasons four and five, the end wasn’t necessarily a surprise to me, because it was something that we all knew was coming for a long time, but I did enjoy the way that we got to move past Psycho and do our own Bates Motel version of Psycho and that mythology, and re-telling it. But then at the same time, moving past it, we were free to do whatever we wanted, and there was no longer that initial tragedy that we needed to play out. I guess you could say in some ways, that came from the end of season four as well, and the fact that we always knew that Vera—well, not Vera herself [Laughs. ]—was going to have to die at some point. So as you tick off those big events, more and more is left open and more guesswork is required by the audience. It’s more uncertain. AVC: We talked with [Bates Motel showrunners] Kerry Ehrin and Carlton Cuse about this recently—how freeing it felt filming Bates Motel’s version of the Psycho story where you did this quite different spin on it, and even though Rihanna is in the motel as Marion Crane, there’s this much more important thing happening right next door in the house, which is Norman’s confrontation with himself. FH: Yes. Yeah, I think so. What was interesting to me is seeing as you sort of said—what’s going on inside the house? What we don’t see in Psycho is Norman’s point of view of the proceedings, as opposed to Marion’s. That question’s always there when you watch the film. “What’s actually going on in the house?” When he goes up there and you hear a couple of screams, what’s really going on? It was fun to get to tell that story and that side of things and that version of events, and get to do some great scenes with Vera, too. I’ll miss those as much as I’ll miss anything else on the show. There’s big showdowns between the two of us. The way in which she can inject humor into it and have such a range of emotions, even when she’s dead, which is terrifying and loving and sort of her own version of insane as she’s smashing up the house and trying to force my eyes open. It was great fun to do. AVC: Watching season one, it felt like Vera was responsible in a lot of ways for finding the tone of the show, because it wasn’t always clear in those early episodes what kind of series it was going to be in terms of the vibe and feel. Was that your experience as well? FH: It seems so long ago now. Certainly, Vera was instrumental from the very beginning in the tone she brought to it. I think it’s nice in episode 10, because you get to see that, and you’re reminded of that, and it brings you full circle to those first moments that seem so full of joy and carefree and happy as they end up at the motel the first time. Full of dreams. And they still have those dreams, but they didn’t end up coming true, unfortunately. AVC: How far out did you learn what the end game was going to be? There’s been fans online since season two saying, “It has to be Dylan who kills him,” but did you have other ideas about what Norman’s ending might be, prior to when you joined the writers’ room? I don’t know, I don’t quite understand those who would prefer that actors just sort of read episode by episode and figure out what’s happening as they go along, because it seems identical to me to writing a story and not knowing what the end is going to be, but just keep writing anyway, and we’ll tell you what happens next week when you get there. “Just write an episode and see where you end up, it doesn’t really matter.” Like those things—I don’t know—it’s always seemed an odd approach. AVC: Your involvement behind the camera this year was not just directing the third-to-last episode, “The Body,” but also writing the teleplay and coming up with the story for the previous episode. You also wrote an episode last season. Was it your own desire to start exploring those creative outlets that pushed you to get involved, or was it something about this story specifically? AVC: Your co-stars, Nestor Carbonell and Max Thieriot, both directed episodes this season as well. Did you talk to them about the process in advance, and what it was like for actors on a long-running project like this to step behind the camera? FH: Yeah, we did a little bit. I always like preparing a lot and probably over-prepare in some ways, but there’s a lot I found about directing that’s instinctive, too. You have to know what feels right and you have to be engaged in the scene that’s happening in front of you as opposed to being a director who comes with this preconceived notion of how the scene will be, and they’ll tell people that that’s what’s going to be happening, and this is what it has to be like. I think it’s a skill that a great director has to be able to be present and watching what’s going on in front of them and putting aside everything that they dreamed it would be, and watching the scene and having ideas based on that, the reality in front of them, as opposed to living in the script or watching a scene and continually looking down and thinking, “It says here in this line that he’s meant to be smiling, so I must make sure…” I don’t know. Taking it to an extreme. AVC: The episodes that you had a hand in creating are very much about Norman’s emotional balancing act coming to a head: In season four’s “Unfaithful,” with the confrontation with Norma and Romero’s new life as Norman returns home, and this year the showdown with Dylan returning to the house and realizing what’s going on. Is there something about these moments, where people can no longer sustain the fantasies that kept them going, that you were drawn to creatively? FH: Yes, I think so. It’s hard. That’s such a good question and I feel like my answer is just going to be completely inadequate. I think that the ideas, thematically, those things have always intrigued me. That’s what’s made Bates Motel sort of special for me. It’s those big scenes that we’ve got to do, the huge climactic scenes, like at the end. It’s funny, just thinking about how they both end with dinner scenes, but that’s how things broke in the writers’ room as opposed to me necessarily ending an episode with a dinner scene. Certainly, in terms of directing, I loved the scene when I got to play Norman as mother pretending to be Norman, as she spins this web of deception to Sheriff Greene, trying to say that actually, it was all Madeleine’s fault. The sort of length of those scenes never really worried me as an actor or as a writer or director, because I find there are so many different levels of nuance in scenes that there’s always something interesting to play. Also, moments that show who Norman really is, coupled with his performance of who he pretends to be—that dynamic of Norman’s has always interested me. I mean, we all do it, but the person that he puts himself out to be in the world, that he sort of purports to be in front of others, combined with the person that he actually is underneath. And, you know, there’s a manipulative side to him at times, more and more this season, perhaps. But at the same time, it’s always coupled with a genuineness about him. I guess in terms of writing, I also try and dig out the humorous beats. The idea that Norman is such a bad liar has always been very funny to me. He thinks he’s a great liar, he thinks he’s got it all under control, and he’s this man wandering around a motel, convincing people that all is well. But when he’s out on the porch with Sheriff Greene and she’s quizzing him and he’s rambling on about various things and pretending he’s just come out of the door of the motel, that’s all so funny to me. But it’s much more interesting to see people not being truthful, whether it’s not being truthful with themselves or with others. It’s much more interesting to play against the emotion, to play against the reality of the thing you’re really deep-down feeling at the time, because that’s what we all do. We may be in love with someone, but we act like we hate them. And it makes those moments of truth more powerful when you finally get there, as opposed to it being like that all the time. AVC: There is that line in the second-to-last episode where he’s talking to the lawyer and he says, “Everyone has multiple personalities, Julia.” That speaks to what you’re saying here—Norman was so often lying to himself. Even at his most open and honest, there’s a little part of him that knows something’s not right about what he’s saying. Was that sort of internal self-lying something that stood out to you as one of the more intriguing parts of the character? FH: Yes, certainly. It keeps making me think—I know we’ll get there at some point–it just fits in so nicely with what we’re talking about now, this moment in episode 10, in that final scene with Dylan, Norman says, “If you believe hard enough, you can make it that way.” That seemed to be such a perfect line to sum up so much of Bates Motel. That sums up Norma’s attitude, that sums up Norman’s attitude, that both of them would come with this sense of hope and a dream and as long as they kept going with that and believed in that and fought for that, then nothing else would matter. I think it’s something that we all have in our life and we’re sort of taught to believe—this idea of, “You’ve got to have your dream and go for it and you can do whatever you want to do in life.” Those things that you’re taught when you’re younger that Norman still holds on to as an idea and that, ultimately, reality says otherwise. So there’s two ways to see that. It’s this very romantic vision that they are actually reunited, and so his dream does come true, to put it in an overly syrupy way. He is reunited with her, and their love will always be eternal, and they’re lying next to each other in their grave, or singing away on a beach in Hawaii. So there’s that version of it. Or, there’s a sort of darker sense to it and more of a truth behind it, that those things that we’re always told will be enough to sustain us and to make us happy in life, aren’t. All he ever really wanted was to be happy. Norman always was trying to be a good person, trying to do what’s right. Ultimately, that wasn’t able to take place. And the heartbreaking thing from Dylan’s point of view is that he wanted that dream, too. He says to Norman, “That’s what I wanted. Of course I wish I could do this. Of course I wish that Norma was still alive, that she could meet my kids, that we’d be together in the family.” That’s what they were about, but despite having a shared dream, none of them were able to have it come true. AVC: One of the tragedies of the finale is that Norman, who actually has spent a good portion of this final arc being aware of his situation, wakes up from the fight with Romero and makes this one last attempt to construct a false reality for himself. But this time, it seems to be such an obvious, desperate, final gambit. As you were doing these scenes, did it feel as though there was almost this death drive in Norman? That part of him has been driving himself toward this ever since Norma passed away? FH: Yeah, I think what’s interesting about that is to what extent he’s truly gone insane or not at the end. Norman waking up in the snow and Romero’s dead and, oh yeah, there’s Norma dead as well, and he’s just here in his insane world and he’s sitting up in the snow and laughing. There’s the humor to it, but there’s also this unwavering commitment—in those moments Norman genuinely believes that this is what’s happening, and that’s what sustains him throughout. But when he gets to that final scene and Dylan starts to put a little crack in that version of events, in that version of reality that he’s choosing to live in, it does seem to reveal itself as being as much a choice as something that he genuinely deep-down believes is taking place. And of course, he’s insane because we’re even having this conversation. But the idea that Norman isn’t aware of reality, I think is somewhat dismissed in that last scene. He kind of knows what’s going on underneath it all. He knows that he is trying to deceive himself as much as he is trying to deceive others. But it’s almost like this test, where he invites Dylan over and it’s like, “If all things go well, then maybe I can live in this world.” It’s sort of his last test of whether he can completely banish certain things and live the life that he wants to lead, or whether he can’t. AVC: That’s what makes Norman a great tragic figure, is that’s he’s a fundamentally good guy who is continually laid low by his illness and events beyond his control. He’s never really seemed at home in this world, and his life has been in large part about trying to create an idealized version of reality to supplant this one, which is something that he sort of learned from Norma. He’s forever being disillusioned with what’s around him when he’s forced to look at it. FH: [Laughs.] I completely agree. As you said, it’s the choice that he’s doing that. It doesn’t necessarily make him any less mad. Perhaps even more so. Or maybe less. But the idea that he’s going through all of these things knowing that they’re insane is almost insanity itself. I don’t know. You can get so wrapped up, and sometimes the reality and the fiction, you get so confused. I get so confused myself as to what’s normal anymore. Doing that scene with—sorry, we’re getting off topic—but the scene with Norman being Mother and then pretending to be Norman. It’s kind of like wrapping your head around all these different things and all of these different performances that everyone is doing. But that’s sort of how we live our lives. It’s the side of us that we show other people, whether consciously or not. But I agree with you. The only reason I was laughing when you said what you just said was because it’s nice to hear people that are still on Norman’s side and will still support him until the end. He thinks that he is fundamentally a good person. I think Dr. Edwards saw that in him. You kind of see Norman trying to live in that world, but I think ever since Norma was killed, there was no real other option for him other than to be consumed toward that tragic end of needing to be with her one way or another, and if he wasn’t going to be able to bring her back, then he was going to go with her, and Dylan was going to facilitate that. Did you think that Dylan chose to kill Norman? AVC: It sort of comes back to that Greek tragedy element of it, where it’s almost like fate, where Dylan has this sense of what will happen. He certainly doesn’t want to kill his brother, I don’t think, in any way, but there’s part of him that knows that he has this role to play in this tragedy, this disaster that’s unfolding, and he almost wants to be ready for it. Does that make sense? FH: Yeah, that makes sense. I just mean I feel like he chooses to, in that moment. I don’t think he arrives knowing, I think he arrives not knowing what’s going to happen at all. Maybe people will see it coming because you think it can only end this way. You can’t go and kill Dylan. Dylan doesn’t ride off into the sunset. That would have been a very odd end. But I don’t think it’s planned in any way on his part. I think in the moment when Norman is pleading with him to take his life and be back with Norma, I think instead of it being this act of self-defense—his finger slips as Norman goes forward with the knife, and, “Oh, whoopsie, I’ve killed my brother”—I feel like he knows what Norman is asking him to do and chooses to pull the trigger in that moment. And that’s a much stronger end for him, too, that he sees Norman and is closer to Norman in that last scene than he’s ever been before. For the first time, really, he understands the insanity and gets it and gets Norman. At the beginning, Dylan makes perfect sense and you feel sorry for him, too, because his worldview is one that we can all subscribe to. But as he tries to persuade Norman and convince him of reality, we sort of see on his face the fact that Norman doesn’t share that same vision of the world, and that’s when I think he realizes—he sees Norman for who he is, he sees they’re never going to be able to live in the same world. They both hope to, but it’s impossible. AVC: Nobody walks away unscathed from this situation. The tragedy of Norman Bates traumatizes everybody around him and makes a tragic figure of everybody involved in this story. It’s a very satisfying ending narratively for that reason. For example, it felt like a real tragedy that Emma goes to see Norman one last time and she doesn’t even get to talk to him. She just gets the mother persona. FH: I feel like that scene brings her and Norman together more than any scene between her and Norman himself could have done. By going along and having a scene with Mother and seeing where Norman has got to, I think that, in a funny way, makes her understand Norman more, and maybe moved her toward forgiving him. The other version where she’s genuinely confronted with Norman, I’m not sure what they would have been able to get out of that. Certainly it wouldn’t have gone toward the place, I don’t think, of reconciliation at that point. AVC: It’s almost like you need the tragedy for there to be any chance for Emma to move forward at all. It needs to be that tragic inability to actually talk to Norman himself. The sadder thing has to happen so that in the long run, it can feel like a more fully-realized understanding for her of what’s occurred. FH: Yeah, exactly. They do get a happy ending, they’ve got that baby. The only hope is that little kid. What’s Catherine going to grow up to be? FH: [Laughs.] I know. That would have been too much, wouldn’t it? AVC: When you think back on filming over the years, what are the moments that will stick with you when you reflect on filming Bates Motel? FH: I feel like it would be the moments in which we all cared so much about Bates Motel and how everyone was so invested in it and lived it and gave it their all. Not just the actors and the writers, but the crew. We had the most amazing crew in Vancouver who chose to come back year after year and would sort of move their schedules around to be able to be a part of it, season after season. It was just a unique group of people who all wanted to be on set that made filming so joyful. An example would be at the end of season four, in episode nine, when Vera and Max [Thieriot, who plays Dylan] are having this climactic scene before Dylan walks out of the door, and he’s saying, “you’ve never been a real mother to me,” and he sort of goes to leave. And Norma calls Dylan back and says, “Dylan!” and you think, “oh, maybe she’s going to say ‘I‘m sorry,’” and she just asks to have the earring back. And then he leaves and she’s left there alone, and then obviously would go on to die later in that episode. I was just lucky to be watching the scene between Max and Vera, and obviously it was so heartbreaking, and it was Vera’s coverage, and I looked down at the end and Dean, a camera assistant, was crying. He finished the scene and he was keeping focus and just crying watching the scene. It felt so special, because everyone cared. All the people in the room, it wasn’t just the actors in the scenes, it was our two main camera guys. They were so invested, too. The DP, who’s been there the whole time, the costume designer, the props guy, they cared so much about every single choice that went into the show, and everyone wanted it to be as good as it possibly could be. That was what made it so special, I think. AVC: I think that’s a lovely memory for us to end on. Thanks for talking with me today. FH: It was wonderful. Thank you for being so involved and engaged in the show. I’m glad you enjoyed it. It’s funny though, isn’t it? It’s all over. That’s it. AVC: Yeah, I was going to say, are you starting to have separation anxiety now that it’s actually over? FH: Yeah, probably still in denial. It’s more when people start speaking to you about the last episode, you’re like, “Oh yeah, I guess that one’s coming out. That must mean it’s over.” But yeah, it’s been great. I just thought Tucker [Gates, director] did a beautiful job with the last episode. It was nice. It came full circle and it feels like a proper end. It’s the people that, when you start speaking about it, you’re like, “Oh, Pete Whyte, who’s our first AD and the producer who’s been there the whole time and Justis [Greene], who’s our line producer in Vancouver,” like all those people who made the show so special and who ultimately just cared about it. And I think that’s rare. I guess we’ll see if I get that sort of experience again, of everyone just being wholly committed to something and to that vision and to believing in the illusion of Norma and Norman.